I recently had the pleasure of hearing Sir Ken Robinson speak. I have heard him speak via YouTube many times throughout my university career on TED talks but it was really great to hear him answer some questions and speak directly to schools in Saskatoon. If students are disengaged they may seem bored and not be learning. You can’t change students so you need to change the way you are teaching. You have to give students a ‘buy-in’ and help them feel motivated to learn/work. Not every student plans on going to post secondary. There are also many different types of schools not just university. Sometimes you need to prepare students for the work force and get them through school and not just push and teach for university. 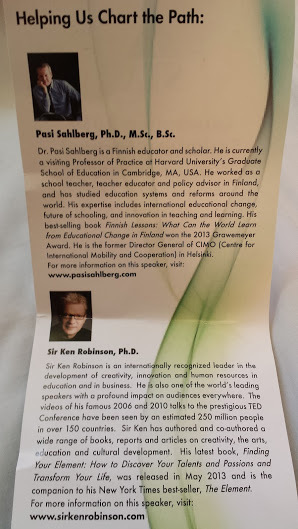 There was also another amazing speaker that I have never heard of before- Pasi Sahlberg! I found it fascinating the differences better different education systems. He has been involved with The Finnish school system. I have also thought that it is important to have humour and a light hearted attitude while teaching and in life in general. Something that has always stood out to me in Sir Ken Robinsons presentations and now also Pasi Shalberg’s presentation is the use of humour. When they talk it is not only informative it is extremely enjoyable. I have always felt that middle years students appreciate humour, kind heart, and positive attitude.